Over the weekend I had a blast with all the people coming into my studio for Artista Vista and Art Day. Yet, lots of work was accomplished too. I finished the two commissioned, small In Boxes...which really aren't too much smaller than the ones in the current exhibit. The client came by and seemed quite excited too. In preparation for OPEN STUDIOS this coming weekend, I decided to paint out all the rest of the heat-activated paints I had mixed up a year ago. I painted mostly with my hands and wadded up pieces of paper. I was a mess but there's certainly plenty with which to work! 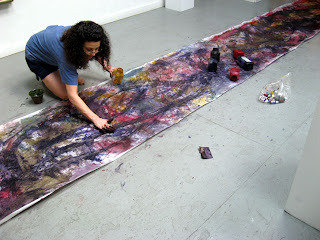 Stephen Chesley, a great painter/my mentor/the artist whose studio is across the hall from mine, took these photos. I will use this paper to demonstrate heat processes this coming weekend. I also bought a new Bernina 220 today. It is my third. The reason for the purchase is more than a little stupid. I bought a free-motion couching foot that won't fit either my 1630 or 1008. I really see potential in this new foot and the 1630 had to go to the shop for repairs. Also, my sewing center was having a clearance sale. 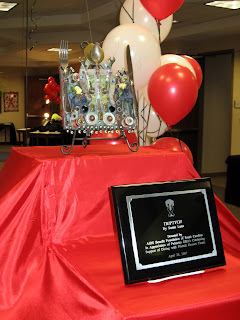 After just over 22 years as a Bernina dealer, the company decided to give the representation to another shop. He wasn't selling enough machines. It is terribly that his remarkable service and repairs didn't count for much. The machine I bought was at a nice discount but for a very sorry reason. Over the weekend we heard rumors about a dance magazine that included an article with Mathias' image. We subscribe to Dance, Pointe, and Dance Europe. We knew there was nothing in these publications. Yet, Steve went to the USC dancer performance on Saturday night. Too many people told him how nice the picture looked. We were really puzzled and finally did a little Internet research. Our curiosity was quickly replaced. A moment of shock dissolved into sheer pride. Mathias and Sasha grace the cover of Dancer Magazine! The article seems to be one of those promotional types...perhaps even subsidized by the Kirov Academy. Many of the sentences are extremely promotional...not exactly investigative reporting. Still, it is a cover and he's positively raved over in the article. Steve and I sent an email and left two messages on the direct telephone line for the magazine but haven't heard a word in response. We'd like to own a copy for ourselves, for my parents, for my grandparents and my sister in Germany. Hopefully, we'll get a chance to purchase these. Later we realized that this is the weekend of the Youth American Grand Prix in NYC. A year ago Mathias won gold in this competition. It seems so much longer ago than a mere year. Today, however, he was on a plane with the rest of Birmingham Royal Ballet as they started their tour to America. They should have arrived in DC this afternoon and were to be bussed to Norfolk, Virginia for that state's Festival of the Arts. Mathias has only very minor roles in this week's American show of The Sleeping Beauty. Yet, he is about to have some awesome opportunities. He's second cast in several soloist roles for the company's May and June performances. He'll be dancing quite a lot and with chances to impress...not just to win medals...to make a bid for advancement...to work professionally. I look at the on-line magazine cover. It is a thrill but it shows a past life. It is fabulous recognition on a day that holds future possibilities. There is at least one parent, likely many more, who might read these sentences and call my take on the situation to be one of ungratefulness or negative thinking. This isn't the case. I am proud. I am thankful that I allowed my son to leave us so early in order to pursue his passion. I am also looking toward my son's future goals, not reliving his past achievements. Most of all, I am excited to see the early June choreography performances in Birmingham. Alex and I are going. Steve will see the shows in Norfolk and is hoping to go to England to witness some of the other dances in which Mathias has been cast. For now, however, we're happy that there's a magazine with a beautiful, Satanilla cover! 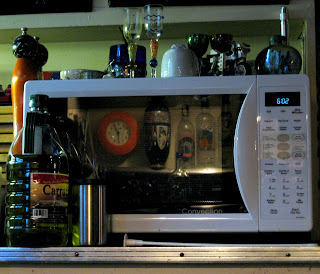 The weekend seemed to start on Thursday with Artista Vista and a red dot on one of my "In Boxes". 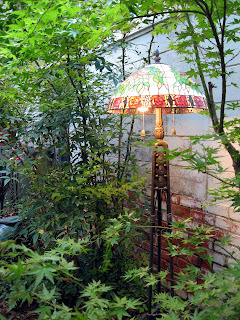 One Friday I got a wonderful telephone call from a Buckeye friend who works at Garvin Designs. The company selected another one of the "In Boxes" for its office....WOW! That's also a line on my resume under "corporate collections"! 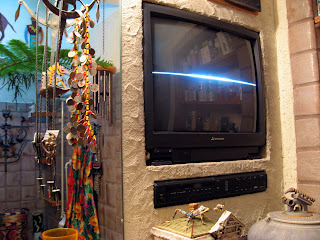 Saturday was "Art Day", a continuation of Artista Vista. We've never had so many browsers in the gallery during past "Art Days". There was a steady flow of people from 10 AM until 4:30 PM even though the official hours were only 11-3. 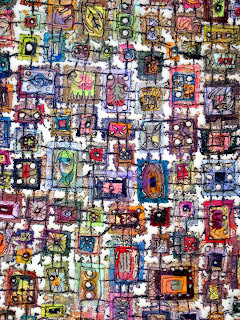 I sold one of the Elements of Architecture embroideries. From there, I went with Alex and Erica to the Dining With Friends Dessert Finale. It was a bit strange sitting in the back seat having my son's girlfriend at the wheel. A year ago, their first date had been to this charity party. Of course, Alex didn't remember this as some sort of teenage "anniversary"! Steve went to the USC Dance performance, a reprisal of some of the Martha Graham choreography as well as Serenade by Balanchine. 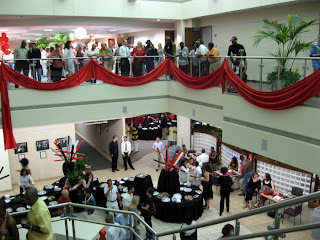 This show was part of the USC's participation in the Columbia Festival of the Arts. I wish I could have gone. Steve said that much of the work was even better than earlier in the year...not surprising, more time seems more practice....so it showed! Steve joined us at Palmetto GBA for the rest of the Dining With Friends party. During the party there was a presentation and photo-op. A plague had been made for the donation of my Triptych from the SC Aids Foundation to Palmetto GBA's permanent art collection. WOW! Another corporate collection line! Yes, it's been a great weekend. 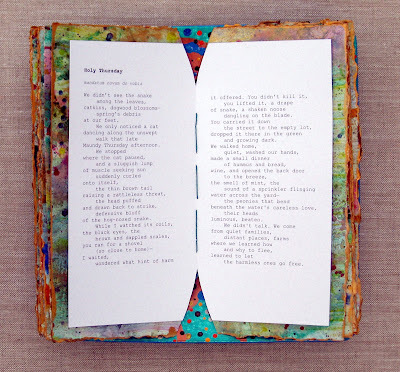 Alex also finished the video on the altered platter/book of poetry. That platter looked great among the fifteen available for silent auction bidding. It had a bid of about $300, I think, though I never saw the final number. There were so many people to talk to and watch. One of the dinners had a 70s Afro and hippie garb theme. They all looked fantastic! I've got to get to the studio. I think I need to create more IN BOXES again! I will finish the two commission pieces today and start new work thereafter! The main gallery, atrium, and hallways were hung with all our work. 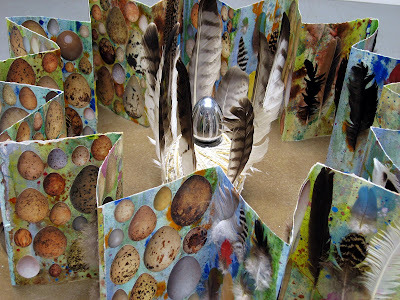 I had four "In Box" pieces in the main gallery and also my artist book "Which Came First?" Visitors paraded through the space and I felt like I was in constant motion, greeting friends, talking about the work, explaining contemporary fiber processes, handing out invitations to the Audubon show, and being "an artist". It was great. 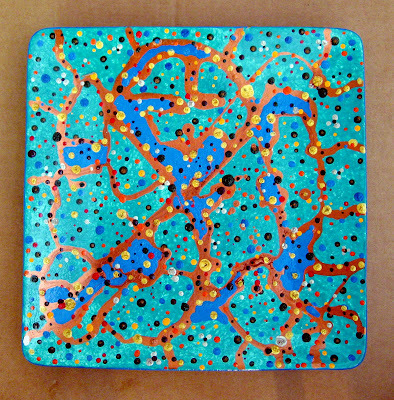 "In Box XXV" sold! It is always so exciting to put a red dot on a piece on opening night. 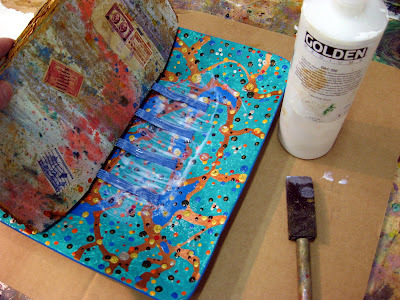 I had my iron on and was able to demonstrate a little fabric gilding....heat activated metallic foils...in my studio. I was using the two, smaller In Boxes that are my commissions. 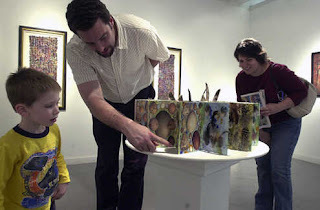 Not only did I demonstrate to a few people, but I had Bryce Hevel helping....generally, I always let kids DO something...hands on, engages them in creativities, impresses/relieves the parents, creates tomorrow's art-buying public...besides, it's FUN! I didn't take these photos. Both appeared in today's Metro Section of the State Newspaper...in color! (I could access one from the on-line edition but could only manage to print the other, scan it, and post the resulting jpeg...hence one isn't that great of an image.) The article was quite nice (copied below). The family was great. In fact, the little boy is a "bat child". What do I mean by that? Well, he's into super heroes, wears clothing to reflect his imagination, and he finds wonder in art and magic. He was wearing a Batman outfit and performed what really looked like a tap dance for other guests in the gallery! Everyone was quite entertained and the child knew exactly what he was doing...capturing the spotlight, creating an audience, enjoying art! Once upon a time, we had a "bat child". Mathias wore the homemade Batman tights and cape for over two years...until I could no longer alter it to fit. He wore it everywhere, to the grocery store, to the Koger Center, to Sunday School, etc. He was mesmerized by art and no one had to teach him how to perform. That desire is inborn, and Mathias is still wearing tights. Bryce Hevel hadn’t been at the Artista Vista gallery crawl for more than 10 minutes when he began making art. 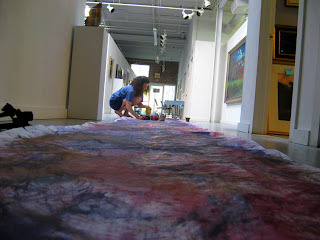 Susan Lenz Dingman put him to work applying gold leaf to one of her fabric pieces. He also got to handle the model and just-started stone sculpture of a shark by Sharon Licata. Vista Studios/Gallery 80808 was the first stop Shawn, Tiffany and Bryce Hevel made during their first visit to the annual gallery crawl. “We’re definitely not stuffy,” Licata said. “What’s cool for me is to get to see behind the scenes.” Tiffany Hevel said. At Vista Studios, the trio spent much of their time in the artists’ studios and talking with them. Painter Stephen Chesley explained to Shawn Hevel how he aims for ambiguity: Is it morning or night? Is that color blue or green? Is it even a landscape? “Every time you look at it, it’s different,” Shawn Hevel said. Later, he dragged his wife back to look at the paintings. “Your husband already got the art lecture,” Chesley said with a smile. The next stop was City Art, where a batch of young artists from throughout the Southeast were showing. Shawn and Tiffany appreciated a small print on plastic of the female reproductive system. “I like the paintings of the woman’s back and shoulders — she was this total rock girl, but it was done in a very traditional style,” Tiffany Hevel said. 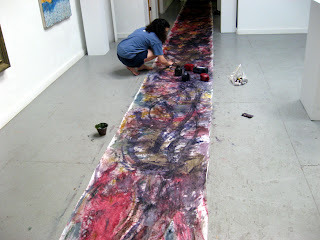 Overall though, and without the artists on hand to talk to, she found the work a bit more difficult. Across the street at the Saunders Gallery, they looked at more of Chesley’s paintings. “I’ve got expensive tastes, because I like his stuff,” Shawn Hevel said. But he made it to if Art for the M&Ms. The next stop was just down the street at the Colonial Center for the Disney on Ice show. When last seen, Bryce was getting into his “Incredibles” costume in the parking lot. Artista Vista continues 11 a.m.-3 p.m. Saturday. During the Columbia Festival of the Arts, we have invited some readers who haven’t taken advantage of local arts offerings in the past to attend an event and share their first impressions with us. Today, we hear from Shawn and Tiffany Hevel (and their son, Bryce), who attended Artista Vista with arts writer Jeffrey Day. 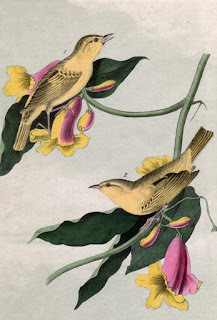 In conjunction with the Columbia Festival of Arts, the Elmwood Park Tour of Homes, and in celebration of its twentieth anniversary, MOUSE HOUSE, Inc. is please to present more than twenty-three conservation-framed, original 8vo hand-colored AUDUBON lithographs dating from 1840-71. The exhibit opens on Thursday, April 26 and continues through May 12, 2007 at 2123 Park Street in the historic, downtown Elmwood Park neighborhood. An evening reception is scheduled for Thursday, May 3 from 5:00 until 8:30 PM. Among the birds includes are the Cliff Swallow, Song Finch, Henslow's Bunting, Tell-tale Snipe, Bank Swallow, Sooty Tern, Clarke's Nutcracker, Solitary Vireo, Hudson's Bay Titmouse, Wood Pewee Flycatcher, and several attractive warblers. 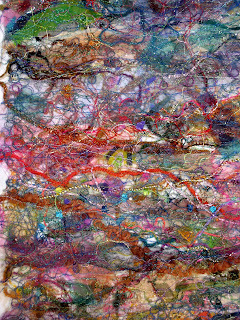 Mouse House, Inc. also has other antiquarian prints; decorative, framed mirrors, and the fiber/mixed media art by Susan Lenz. Steve and I are quite excited. This is truly a busy time of year. This week is Artista Vista, an annual art opening that includes my studio, the Dining With Friends charity fund-raiser, and all the Audubons must be hung and ready! The Columbia Festival of Arts is including Mouse House on its free art experience bus tours on May 1 and 2. Then, we host the Audubon reception. 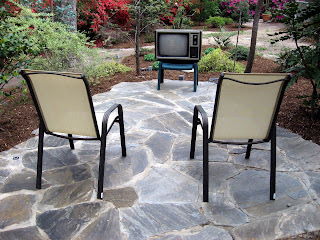 The day after the reception, Steve leaves for Norfolk, Virginia to see Mathias and Birmingham Royal Ballet perform The Sleeping Beauty as part of the Virginia Festival of Arts. I have OPEN STUDIO that Saturday and Sunday....and Alex will run Mouse House that Saturday during the Elmwood Tour of Homes. Lots of work....but quite exciting! Mailing Invitations to the AUDUBON SHOW! Last week I designed the invitation for our Audubon exhibit and had them printed at Kinkos. Alex stuffed the envelops. I hand addressed each one, including our return address. Yet, to assure that these invitation get more than a moment's notice, I provided unique stamps. Two stamps (10-cents and 24-cents) were the peel-and-stick sort from the post office. The remaining postage came from an estate auction. 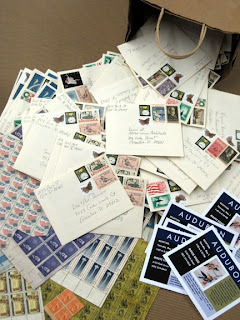 We purchased about $75 worth of uncancelled stamps from the late '50s and early '60s, mostly 4-cent stamps but some in other amounts. I had a blast doing this and thought it was quite an original idea.....however, I learned that there is a company that offers this sort of mailing idea for a price and that it is considered "very Martha Stewardish". I've never seen her on television...except on the news when she was in trouble for her stock dealings. Oh well, I bet the post office really loves me today. I doubt that the modern scanners can successfully deal with these pretty stamps! Alex dumped over 300 into the box yesterday in the late afternoon! 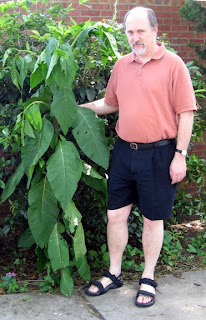 Every year there's this ugly, big weed in the backyard. Every year is grows bigger and bigger. Steve loves it. It is his "pet weed". Every year I accidentally back my van into this plant. 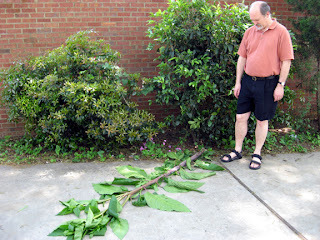 Of course, it is just a weed; it breaks off at ground level when hit by a van. It withers almost immediately. Steve gets sad and insists I hit it on purpose. Yesterday, I accidently hit the pet weed. I SWEAR IT WAS AN ACCIDENT! I finished the Lilac Fairy and have started another piece based on The Sleeping Beauty Ballet. This one will be different. It presents several new challenges. I'm trying to incorporate a strip of white, polyester fur and lengths of natural suede, like laces of Indian moccasins....yes, this is for "Puss 'n Boots and the White Cat". This weekend I updated the website for Gallery 80808/Vista Studios. It is such a thrill to make alterations on a real, globally accessible website! I even updated my own pages! 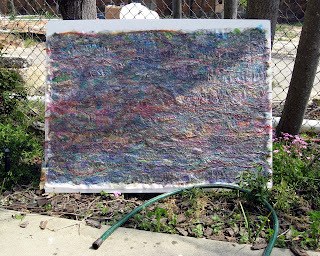 Months ago I planned to show my newest burnt felt work for the annual spring arts event called Artista Vista. I created four in my on-going IN BOX series. I figured I could spare one for the McKissick Museum charity fund raiser. I thought that at $575 it wouldn't sell. It did. Of course, Dana Blau bought another one. The nice lady that took one on approval also finalized the sale this weekend. She also bought the grouping of "Fragments" that I'd shown individually during the January show but later put together in one frame. Basically, I've just come off my most successful selling week ever. With the four big stained glass pieces leading the way, I sold Strata II as a commission and ended the week with two more pieces going to happy homes. Of course it was obvious that my Artista Vista plans had a flaw....I sold three out of four! So, this past week and weekend I've been working hard. I completed In Box XXIV, In Box XXV, and In Box XXVI. 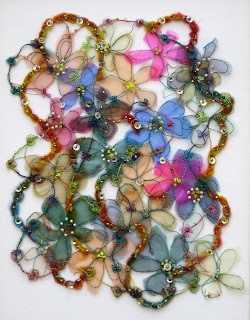 Each piece in this series is created using previously painted WonderUnder on acrylic, craft felt. The individual "boxes" are all polyester/stretch velvet. 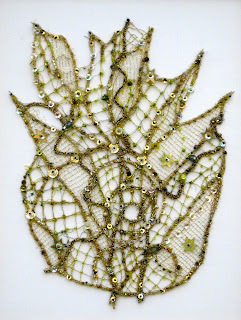 I use mainly copper and gold heat-activated metallic foils and free motion everything together with 100% cotton thread. 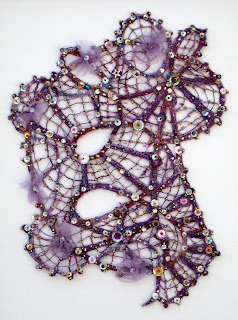 I put fragments of sheer, nylon scarves over the top to make the free motion work just slide over the piece. The final steps are done with the piece stapled to stretcher bars in order to avoid uneven shrinkage. This is when I use a soldering iron to poke holes and little lines. Finally, I use a heat gun on the reverse to melt away all the acrylic felt between the shapes. These final acts are done outside for ventilation! This is the technique requested for my upcoming exhibit at Francis Marion. Thus, I still need more work....but my Artista Vista plan has been salvaged! We've had an emotional week after learning that Alex was not accepted into the Governor's School for the Arts in their drama program. Hopefully, this is a turning point for him. Hopefully, he has discovered that grades and attitude are actually important. He certainly is bright enough. He certainly can be the most charming young man in any room. Fortunately, the interim grades just came out. Alex had no Ds or Fs. While this might not be cause for celebration, it is better than most of his other grade cards/interims over the past three years. I warned that even one D would prevent him from escorting his girlfriend to her senior prom. So....they could go. Yet, she doesn't want to go. She didn't attend her junior prom either. She didn't like any of the dozens of dresses she tried. Alex had accompanied her while shopping for a dress to wear for Festival of the Trees last November. They went to every shop in town. As Alex put it, "She's gorgeous and thin and looks great in all the dresses but doesn't like any of them!" He didn't volunteer to help shop this time. They might go bowling instead! DP Professionals has one of the most elegant conference rooms in town. The table is beautifully inlaid. It is a trapezoid in shape, mirroring the angles of the room. The focal piece is a large oil by Brian Ruthenburg. There is currently only one other piece in the room, In Box XXIII. Soon, Strata II will complete the decor. I have never been so honored. 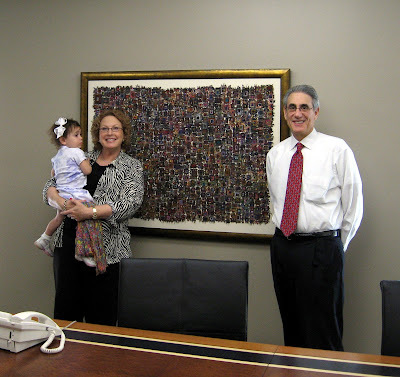 This image is of Dr. and Mrs. Roger and Barbara Blau with their adorable granddaughter in front of my artwork! I haven't posted much during the past week. As I mentioned in a previous post, I've been BUSY. The result has been TIRING! Alex and Steve took this picture of me one evening this past week. 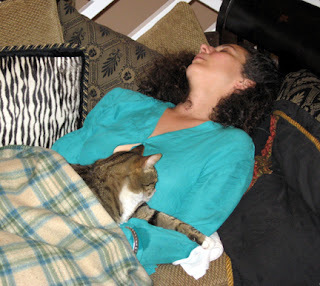 I'd fallen asleep on the sofa with one of our two cats....the one that generally will not sit with me because I "move" too much while sitting and stitching. So, what's been going on? Well, the sale of the four, large stained glass/burnt felt pieces went through successfully. I took Strata II to DP Professionals. They loved it. We will frame it to match In Box XXIII and deliver it next week. I finalized the commission on two, smaller In Box pieces. Steve and I finished a very large order for an interior designer in Charleston. I delivered it. We framed all 38 original 8vo Audubon prints for our upcoming exhibit at Mouse House. Yes, this last item is quite exciting. Mouse House is having its first evening exhibit. Technically, it opens next Thursday....which is also Artista Vista, the annual spring gallery event in which Vista Studios is a large part. 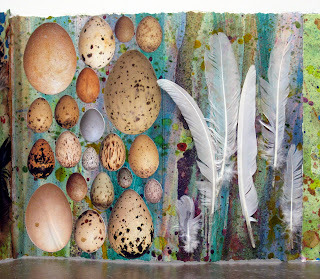 The Audubon opening is on May 3. Thus, I've designed invitations, had them printed, and have envelops all hand-addressed. I've got to stamp them and mail them by Monday. I've also got to rehang most of our gallery space. In the meantime, I had to rehang my studio. With the four stained glass pieces gone, everything had to be rearranged. I've also been to Tyrone Geter's opening outside my studio door, to a Vista Guild meeting, and am trying to produce more, larger In Box pieces in time for the Artista Vista show! I'm exhausted....but thrilled with this level of artistic success! Well, there's good news and bad news....and plenty of both. I'm swimming in frame work. That's both good and bad together. It always means a certain level of financial security but it generally means less time in which to create art. Good news: I finished The Fairy of Gold. I'm more than halfway through The Lilac Fairy. Everything for the upcoming exhibit in Edisto is working out. Janet Kozachek and a friend even dropped by my studio over the weekend. Bad news: This is the worst. I'm still crying inside. Alex was not accepted into the Governor's School for next year. Sure, he's got loads of talent; but, I'm sure all the applicants had some level of talent. What he's lacking are the grades and the eager attitude to please an academic staff. One out of three isn't good enough. We all hoped that Alex might get this opportunity and use it to turn around his life. This isn't to be. Yet, perhaps this is the "wake up call" he needs to start succeeding...to find a passion and work hard for it. 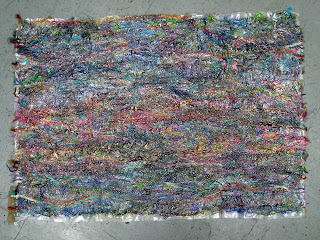 Good news: I've got an appointment to take Strata II to Barbara Blau's gorgeous office this Wednesday. I've also received a commission for two, new pieces in my In Box series...made to specific measurements. Bad news: Our neighbor's dog died on Saturday. CJ was the only dog on the block and we liked him quite a lot. Good news: I've got three pieces of my artwork out on approval with one client. Then, another nice lady took three of the four "Stained Glass" pieces on approval. She called and said she loves them, wants them, plus wants the fourth. The sales is suppose to take place on Tuesday. 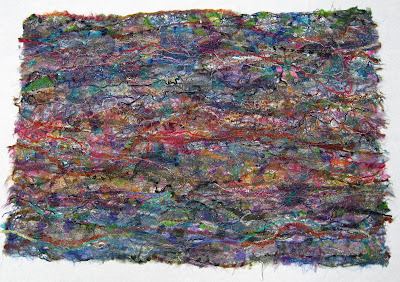 Also, the gallery curator for Francis Marion University invited me to show work in their fabulous location this coming August through September....she wants the "burnt felt" work. Bad news: (Not really bad...just a little "scary"!) If the sale of the Stained Glass pieces goes through as planned, I'm desperately short on "burnt felt" work, especially since I have the commission to do beforehand! Good news: Alex and I saw Tick, Tick Boom at Trustus on Friday night. 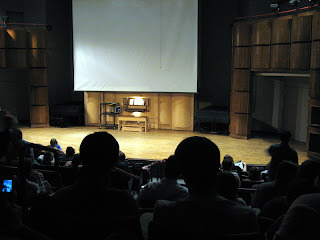 It was very good as was the USC Dance Company performance that we saw on Saturday night. I'd write more, but....I'm swimming in work! Dr. Ed Madden, an associate professor at the University of South Carolina and a published poet, agreed to collaborate with me on a special project. Four of his poems (two already published) were used with my mixed media ideas. The result is one of fifteen platters produced by local artists for the Dining With Friends Dessert Finale. It is an honor to be selected as one of the artists. It was my great pleasure to work with Ed's words! I hand-painted heavy watercolor paper for the pages. The poems were printed with help from Traci Coleman at Kinko's. Without her, I don't think I ever could have managed the alignments needed! These pages fit inside the watercolor pages. I used an open binding over ribbons. 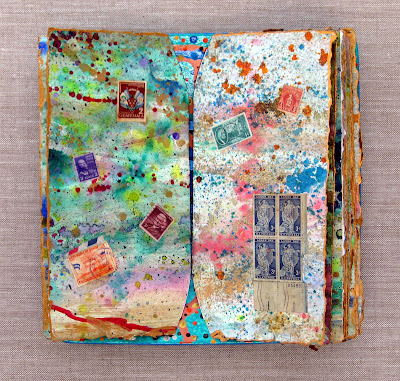 Vintage stamps, some hand cancelled, were collaged on the watercolors. The trickiest part of the project with getting the book attached to the painted platter. I used GAC 200, the least flexible of the polymer emulsions and one specifically designed for non-porous surfaces. 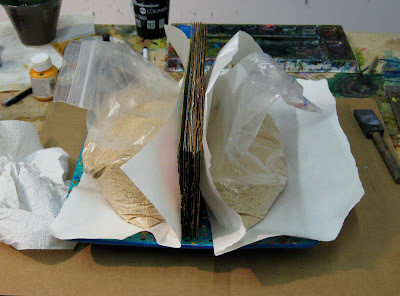 Silicone covered paper with Ziploc bags full of sand held everything in place while drying. Alex and I will soon be creating another video of this project. We're still collecting files to be used. We're planning to include a brief biography for both Ed and I, information about the local charity organization (Aids Benefit Foundation of South Carolina), the logo for the charity (we've got permission already), and pages of text so each poem can be easily read. We are also trying to find a perfect recording of an Italian song mentioned in one of the poems. Above is an image of the platter before I attached the book. I painted it with Glossy paints. These are the colors that are baked in an ordinary household oven to a hard, enamel surface. Mouse House also creatively framed the poster for this year's event. I used automotive primer on a variety of found objects and screwed them all onto the white, wooden frame. Which Came First....The Chicken or the Egg? 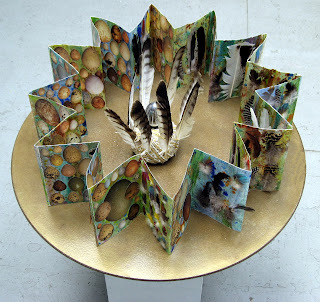 I've been thinking about this artist book for months. I collected the chicken feathers last autumn at the South Carolina Fair and bribed Alex to carefully wash them months ago. I cut all the egg illustration out while watching television during Christmas. Yet, I didn't actually make the book until last weekend. With no beginning and no end, it certainly doesn't attempt to answer the age-old riddle....but it certainly illustrates it...WHICH CAME FIRST? The book was lots of fun to make, but something was missing when I finished. The center seemed so empty. So, I wrapped a cheap glass candlestick that had been part of my Blues Installation with several kinds of yarn and put a silver egg on top. My Dad gave this egg to Alex sometime last year. It is a sort of "worry ball" and actually makes bell-like sounds when moved. Still, this centerpiece needed more. I added the feathers Alex and I found after an ice storm. The poor bird of prey didn't survive the weather but his feathers have been put to good use. There's a possibility that these feathers are illegal...but we certainly didn't kill the bird. We just salvaged his plumage because it was so beautiful. 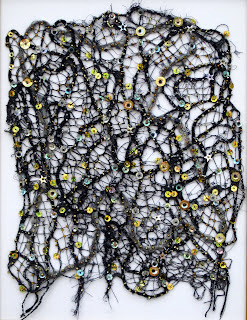 I will put this piece in the upcoming Artista Vista show in the gallery outside my studio. Alex will soon be creating a video. 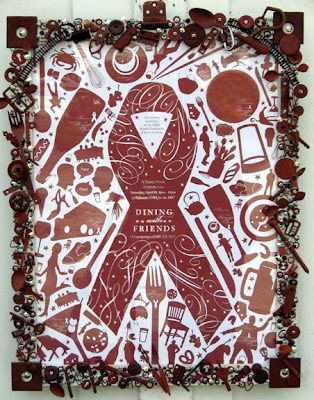 I also finished the altered platter/book for the SC Aids Foundation charity event called Dining With Friends. It is a collaboration with Dr. Ed Madden. He wrote the four poems. I created the mixed media piece. He and his partner Bert came by my studio today to see the completed project. Alex will be making a video of it too. There are people in Columbia that complain about the lack of cultural activities in our town, but I'm not one of them. Sure, I've pointed out the lack of quality presented by some groups.....but, there's plenty to do here. Take this week, for example. Steve and I attended the annual USC student and facility art auction at Capstone. It was lots of fun even though the bidding moved at a snail's pace. One reason for the dragging tempo was that the auctioneers weren't professional. They were members of the university and community leaders. Larry Hembree sold several items as did Dr. Sorenson, the USC president. Most weren't great on the microphone but each brought their own sense of style and humor. We didn't buy anything but enjoyed seeing others waving their numbers up and down vying for the top bid. The next evening, Thursday, we went to see Alex in the Dreher High School senior directing show. Four plays were shown. Most were the type written with educational purposes in mind...a way to introduce teenagers to various classic plays by incorporating them into the narrative. Easily, Hard Candy was the best of the four. Fortunately, Alex was cast in this play. Several students gave stand-out performances, including Alex. He was absolutely great and wore the pants he made as a costume. We laughed, genuinely enjoying Alex's role...so did everyone else in the auditorium. This evening I attended the wine and cheese reception for Pat Parise's art show at in the gallery outside my studio door before going to USC's Recital Hall in the Music building to see two classic, black & white silent films. These weren't just silent films...they were Charlie Chaplin films: Easy Street and The Kid. 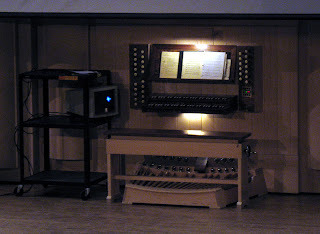 What made the entire experience unique and totally entertaining though was that Dennis James played the organ music. Steve and I were truly honored to meet Mr. James. We fondly remember listening to his playing at the Ohio Theater in the late 70s and early to mid 80s. We used to attend the summer movie series. It cost just a dollar apiece. The Ohio Theater had been recently renovated to its former, velvet and gilded glory. We saw such movies as The Third Man, Casablanca, The African Queen, Gilda, Vertigo, Singing in the Rain, etc. 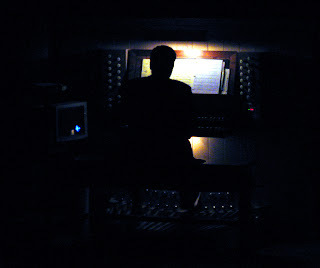 Yet, one of the best parts of such an afternoon was listening to Dennis James play the organ. One knew the movie was about to begin when he crescendoed into Beautiful Ohio. He could bring tears to my eyes in the first four tones. Anyway, watching the silent films and Dennis James creating the perfect, historically accurate accompaniment was a real treat. The price of admission was FREE. We were invited to a reception for him but opted for dinner at Tios instead. Alex, who really had no idea who Charlie Chaplin was, also had a great time. Every day there seems to be something wonderful happening somewhere. Sure, we can't attend all the events but I just can't understand complaining that there's nothing to do or that this is a cultural wasteland. Sure, Columbia was just found to have the worst drivers in the entire nation, but maybe these are just folks anxious to see the newest cultural entertainment! Fortunately, I got an opportunity to give back to my community. Some of the young people working for City Year called in a desperate situation. It seemed that they had plenty of donated mat board and lots of standard size frames. Some commercial frame shop had gone out of business and these supplies had been donated. The City Year team is "babysitting" K5 through 5th graders who need attention next week during spring break. They devised an magazine collage art project but just didn't have a way to cut the mat board to fit the frames. The mat board was to serve as the substrata for the project. I volunteered. It took over two hours and I got a blister on one finger but all the board was optimally cut down to usable sizes. 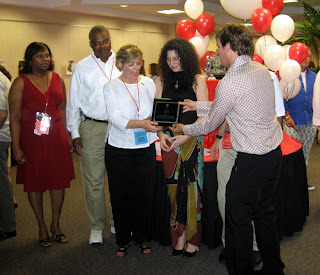 The City Year people were more than grateful. I figured that I got the pay back to my town for all the good things we have here. Plus, I was always fortunate. I owned my own business. My kids just came home for spring break and other school holidays...but I still could work. I always let my employees bring their kids too, but not all businesses can do this. Not all families are so lucky. Fortunately, City Year is helping. Fortunately, I got to do my part too. Two More "Fabrics Fit for a Fairy"
Although it has been a hectic week with too much framing work to be done, I did manage to finish two more pieces for the upcoming show at Fish of Cut Bait Gallery in Edisto. They are Fairy of Darkness and Fairy of Playfulness. 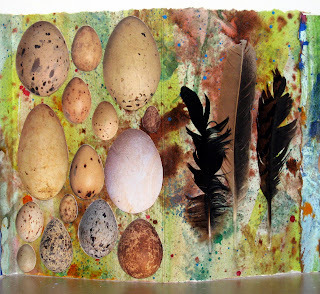 I've also completed another artist's book called Which Came First?This is a project I started last year. 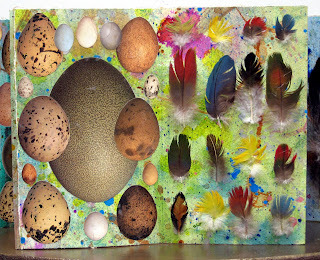 Months ago I clipped hundreds of egg images from a book. Months ago I collected chicken feathers at the State Fair. Later Veta, who owns an exotic bird shop, gave me a ziploc bag of beautifully colored, small feathers. Thus, I am nearly ready to capture all the eggs and features digitally and have Alex make another video. The altered platter/book for Dining With Friends is nearly complete too. Soon, that will have a video too. Despite a busy weekend full of fun activities (A Fool For Art and a Bohemian Garden Party and the Stars of NYC Ballet), I spent most of the time sewing in my studio. I finished Strata II. Hopefully, Barbara Blau of DP Professionals will like it enough to have it in her incredible conference room, right by In Box XXIII. I actually started the piece the weekend before and have been working on it for hours almost every day since. I spent more than two hours just laying out strips and pieces of sheer chiffon, interesting yarns, snippets of gauze, millinery netting, ribbon, and ravelings of assorted thread. A new soluble fabric with a sticky surface. The sticky side of the fabric is covered with a silicone coated paper to protect the adhesive surface. Threads, yarns and fabric pieces can be arranged on the sticky surface enabling the a whole design structure to be built up in its entirety. That's pretty much what I did. 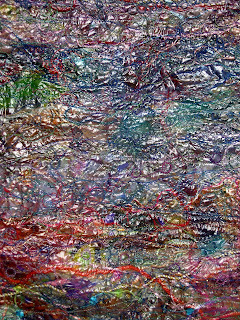 These images show the threads, yarns, and fabrics trapped between the heavier, sticky surface and the sheer, clear water soluble top. Because I used so many fibers, I also had to pin the piece together for the initial stitching. I stitched...and I stitched...and I stitched....free-motion mostly but also a few of the open patterns available on my Bernina. 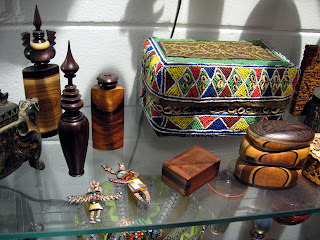 Carefully, I made sure that everything was interlocked to something else with machine embroidery. Without some sort of connection, the piece could fall apart--at least in places--when dissolved. I could check the reverse side easily. The heavier, sticky side looks sort of like interfacing...it is white in color and allowed me to check the density of the machine embroidery. 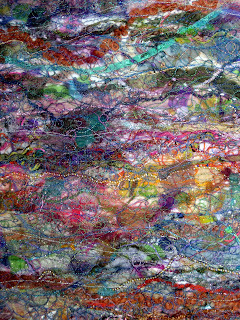 (Photo above) The shiny side, being clear, let me "draw" wavy patterns, circles, and whimsical lines to connect all the yarns to one another. Finally, I pinned the piece to an over-sized sheet of foam-centered board and hosed it down with water. I poured water for over five minutes and directed it at every inch of the piece...not once, but twice...once on Saturday and once on Sunday. It is still a bit stiff, which I like. To remove this stiffness, I could have hosed the piece down again to remove all the residue of the water-soluble fabric. As is, however, I think it is wonderful. 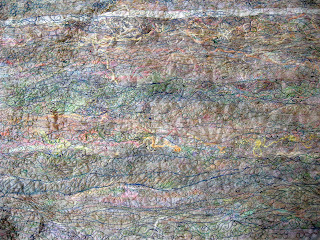 It has all sorts of layers, perfect for its title, Strata II. I hope Barbara and Dana, her daughter, like it! Steve and I really enjoyed lurking around the crowd of party-goers. 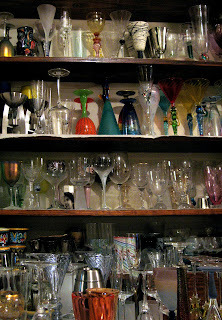 Wine flowed freely into dozens of one-of-a-kind stemware. 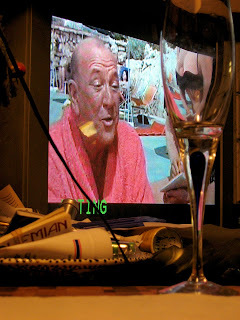 Finger food, displayed attractively in all all sorts of functional artware, was spread over the covered hot-tub inside. I snapped pictures, but I wasn't the only armed with a digital camera. At least two other guests knew to bring theirs along! The afternoon seemed suspended between a Hollywood fantasy of a Tolkien-like Renaissance era and the benefits of twenty-first century technology and cleanliness. "How do those air-filtered really work? ", I wondered. There is no physical way to dust such a collection! 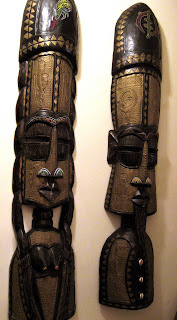 My eyes darted from vivid azalea blooms to African masks to modern whimsy made with wire. Part of me desires to live in such a place...most of me just wants the opportunity to create this many fine works. 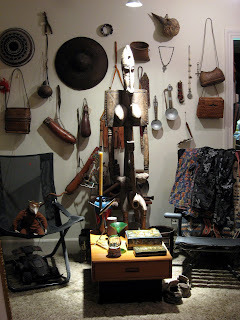 All of me is grateful that Bruce and Denise, owners of Bohemian Home, has my African series on display inside their shop. 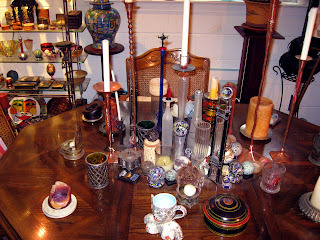 I was honored before, but after seeing their personal collection, I am doubly honored. Bruce and Denise live in two separate houses, his and hers, on at least two lots of land within the city limits...yet the feel of the place is like an oasis, a romantic setting that clearly allows both to coexist while maintaining separate identities. 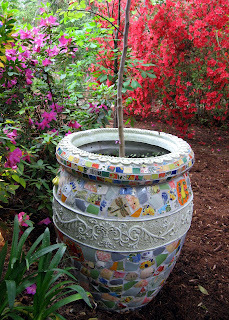 While wandering through the two houses, it is clear that both owners possess a keen eye for unique objects, respect for craftsmanship, and admiration for creativity. Still, the two locations also show clear independence. Each is an environment carefully constructed for personal enjoyment, harmony, and freedom of expression--designed specifically for the lone owner. There is a "middle ground" too, an enormous yard equipped with a hot tub, plant life, and enough room to gaze up on a starlit night. There's plenty of romance; plenty of wide open space. 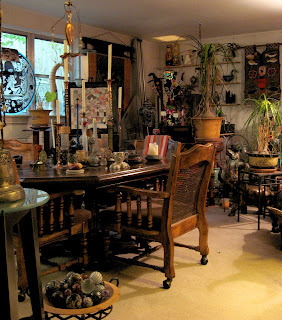 Both houses are filled to the brim with quality articles and artifacts. These are homes designed to hold art, to live with art, and in which everything is art--down to the silverware, the bathtub accessories, and the door mat. All art; nothing but art. There's years of dedication, love, and connoisseurship at every angle.